— cost of motility, both explicit cost and the implicit opportunity cost of not finding a new empty location. — cost of switching to the less efficient glycolytic metabolism. Note that a GLY agent faces this cost regardless of interactive partner (it is present in every column of the 3rd row), similar to how I define cognitive cost in agent based models. — effect of an acidic environment. This represents both the cost that a normal cell incurs when functioning in an acidic environment, and the benefit that a glycolytic cell experiences when its microenvironment is more acidic. 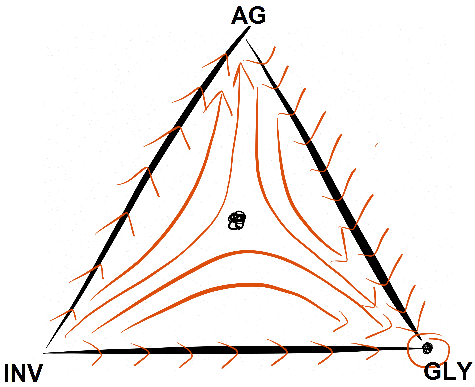 This is only relevant to the AG-GLY interaction, since then a higher environmental acidity is maintained that is not present with either two GLY or a single GLY (that happens when an INV moves to a new spot upon noticing an AG). I don’t understand the biology behind this process and would like it if someone could explain it to me in the comments, since — as we will see in the analysis — a large effect is essential for stable coexistence of an AG-INV-GLY polymorphic population. if we have a stable polyclonal population with proportion of invasive cells. if , it is a harmony game and the population flows toward the AG endpoint. If (or in original parameters) then it is a PD and the population flows toward all GLY. Since we can set the parameters to achieve any combination listed above, this allows for 12 possible boundary conditions on our simplex represented below. 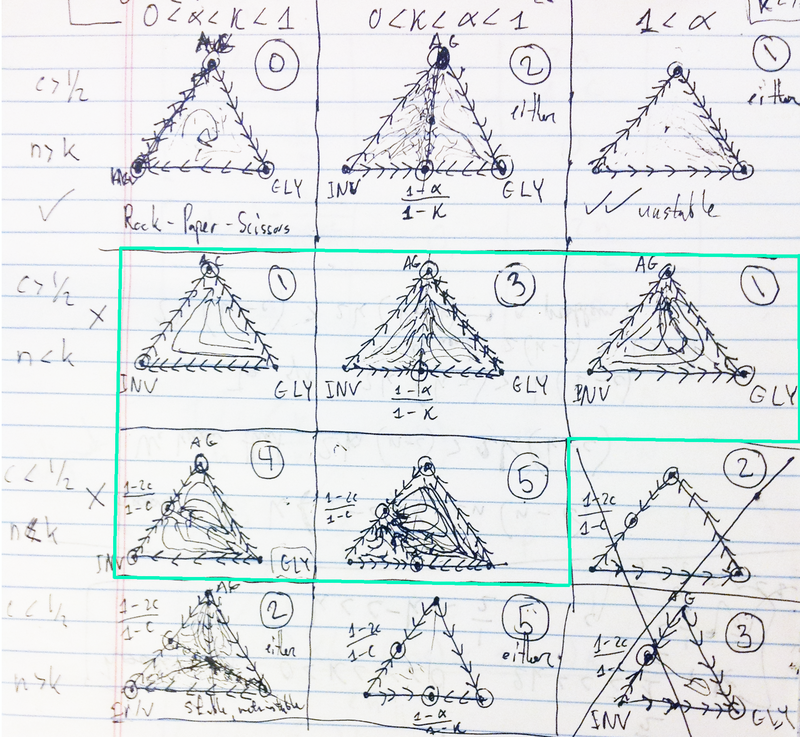 When combined, conditions 1.2 and 3.3 result in a constraint of which is not physically meaningful, so two of the conditions (on the bottom right) are eliminated, leaving us with 10 simplexes to consider. The 12 simplexes with distinct boundary conditions. The ones in the green region have no internal fixed point and result in the same qualitative dynamics: no GLY in the population. The two simplexes in the bottom right are not physically realizable, since they require k < 2. The top left corner is a rock-paper-scissors dynamics and an internal fixed point always exists. In the remaining 4 simplexes, a fixed point exist if a certain condition is satisfied and thus each one of those simplexes can describe two qualitatively different dynamics depending on if the fixed point exists. If any component is less than zero then the internal fixed point does not exist. Looking at the first component, we see that there is no fixed points when condition 2.2 is met, thus the 5 realizable simplexes in the green box have no internal fixed point and any initial condition will have a flow to the INV-AG face where it will result in all AG in condition 1.1 and a polyclonal population with no GLY in condition 1.2. On the other hand, in the top left corner (when conditions 1.1, 2.1, and 3.1 are met), a fixed point always exists and we have rock-paper-scissors dynamics. Depending on if the fixed point is stable or not, we either spiral in towards it with oscillating levels of INV, AG, GLY or spiral away from it until two of the strategies go extinct. In the remaining 4 cases, a fixed-point can exist or not depending on the parameters. Of the remaining cases, my favourite is the top right corner (when conditions 1.1, 2.1, and 3.3 are met) and you have an unstable fixed point (if ) then you get the dynamics on the right. An interesting feature here is that your end state can depend very heavily on your initial proportion of cell types. Even though glycolytic cells can outcompete standard proliferate cells (AG), if there is a certain concentration of invasive cells then it can lead to long term behavior that tends towards all AG. Finally, the flow diagrams are exhaustive and let us make rigorous qualitative conclusions about tumours. If we want tumors to remain benign (not invasive) and not glycolytic then there is no way expect to have and . However, if we just want to have a chance of avoiding invasive genotypes then we can replace the restriction by and find non-invasive but potentially glycolytic populations. The two rightmost simplexes in the upper row must be studied more closely to make specific treatment recommendations. Of course, this isn’t the end of the story since all results in this post are for randomly interacting cells and we might want to consider introducing some spatial structure. Just checking our work here Artem… I know we did most of this analysis late at night (as it is now as well). In Case 2, when n /leq k, is it not a Harmony game? You are correct, that is definitely the case. Leadership and PD don’t even border each other, I just get leadership and harmony confused in my mind as names because they are talked about so infrequently. However, the analysis is actually done as if it was Harmony (since leadership would have a mixed equilibrium, not all C). I will fix it up once I get back to my laptop.